If your walls could talk, what would they say? Would they speak of centuries past or would they only recall the last ten years? Even though Dallas new construction is booming, there are still many historic homes that are preserving the past. Recently, Blackline Renovations had an opportunity to take a peek into history during a renovation project. During a kitchen, bathroom, and closet remodel a few months ago, we were surprised to find something besides the usual debris inside the wall of the closet. It was a book, titled, Goethe’s Faust, published in 1896. Inside was a name, Bettie Graham. The homeowner went to city hall to find out more about Ms. Graham. A search of the tax rolls revealed that a person with the last name of Graham owned the house in 1960. It was purchased for $25,000 and the average annual income at the time was only $6,000. In 1960, John F. Kennedy defeated Richard Nixon for the presidency, a gallon of gas cost 25 cents, and Gunsmoke was the most popular television show (source). After the discovery, the owners, Denise and Greg Brown, decided to create their own time capsule to hide in the wall where the book was found. 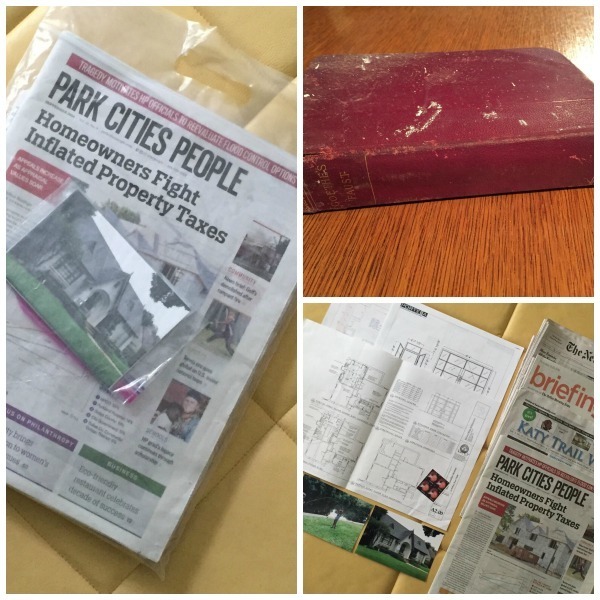 Their daughter helped them pick some of the items to include in the time capsule like some newspapers, a family picture and a picture of the front of the house, blueprints from the remodel, and cabinet and window shop drawings. Time capsules have long been a way to communicate with the future. Now when time capsules are found archaeologists, anthropologists, and historians analyze them. Dallas has an interesting history with time capsules. In 2014, a group of Freemasons opened up a one hundred year old time capsule that had been buried in the cornerstone of the Masonic lodge in downtown Dallas. It was so well entombed that it took hours to uncover it. Inside, the time capsule held a Masonic lapel pin, a rusty pocketknife, old coins including an Indian head penny, and an August 23, 1913 edition of The Dallas Morning News (source). Unfortunately, the contents were compromised from years of water damage. Want to make your own time capsule with your family? Check out this list for some great ideas. Make sure you have a good way to seal it up and keep water and air out. Zip top plastic bags are a good way to preserve your treasures. And don’t forget to mark where you put it. Happy history hunting!